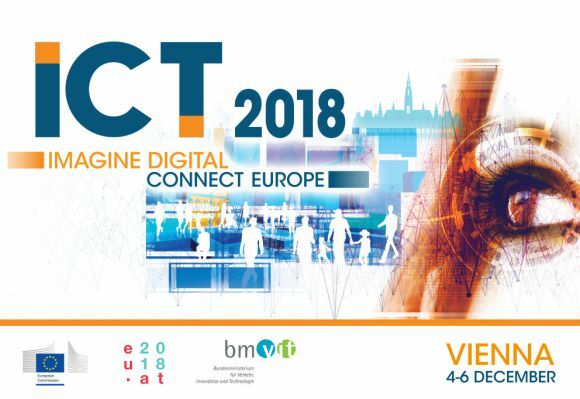 From 4 to 6 December at the ICT 2018 exhibition in Vienna, EOSC-hub, OpenAIRE, RDA Europe and FREYA projects are opening a joint booth in the European Commission Village. It is designed to be a focal point of discussions about sharing and opening science, transforming policy-making and society via informed decision-making. Topics such as sharing of resources, economies of scale on computing power, sharing of data and enhanced accessibility and reusability of research results will be open for discussion. The four projects aim to cater to visitors with diverse backgrounds, with a simple and fun approach. A series of demos will be showcased, along with cases from projects that benefited from Open Science. OpenAIRE will present its services on Open Science, the open innovation challenges and citizen science activities. FREYA will show the value of “persistent identifiers” that allow research resources to be reliably found and reused, as well as linked together in networks—the “PID Graph”. RDA Europe will showcase its solutions, the RDA Recommendations & Outputs focused on enabling open data sharing and EOSC-hub will present visitors the services and resources that can support their daily work. Moreover, the visitors will be able to understand how to benefit from the above initiatives at their national level (via NGIs, the National Open Access Desks - NOADs, RDA national nodes) or other through channels like FREYA’s PID Forum. In this context, visitors will be encouraged to indicate in an interactive way their Open Science challenges and they will learn more about best practices, tools and services available to make science more open, efficient and attractive to non-scientists. Their contribution will be part of a wishlist to be taken forward by the four initiatives. If this resonates with you, we are looking forward to meeting you there! Two networking sessions are also scheduled on Wednesday 5th and Thursday 6th to learn more about RDA Industrial partipation and engage with RDA National Nodes. The RDA is a community-driven membership organisation that seeks to build the social and technical bridges needed to support open research. It does this via global collaborative activity run in a series of member-initiated Interest and Working Groups. Established five years ago, it has grown rapidly to support over 7,000 members from over 137 countries. Over half of the membership is based in Europe, a very active space and fertile ground for collaboration. Data is a primary concern for a wide variety of industries and commercial providers who play an important role in providing the infrastructure and tools needed. We see potential for many reciprocal benefits from public-private partnerships in this space. The practices of RDA can assist industry in managing and sharing its data, and industrial solutions and technologies can be applied in academia. Demonstrate how existing RDA outputs or Interest Group and Working Group activities can be used in public-private partnerships. The RDA value proposition for industry: engagement opportunities and future actions. Industry and SMEs are crucial players in the usage of data, at all stages of the data value chain. The use of data – and especially research driven data - is relevant for the economic growth and social development. Data Policies that are closely related to the forthcoming EOSC, its terminology, its legal requirement and common understandings, help to create a more efficient working environment and harmonize the efforts of all involved stakeholders. If you are performing analysis on regularly / continuously updated, growing or otherwise changing data, then this may be something to take a closer look at: The RDA has developed recommendations on how to efficiently and precisely identify arbitrary subsets of potentially highly dynamic data. This enables citation, but also increases tractability of analytical results, reproducibility, trustworthiness and transparency of data-driven decision making. These concepts have already been implemented by several data centers, ranging from medical databases to satellite image repositories for climate research. Originally created by the EU to promote government open data publishing and re-use across Europe, since 2014 the European Data Portal programme has become the centre of a diverse community for whom the impact of the change enabled by data has become the focus, whether open or shared data, from government or industry. Building on previous joint workshops and meetings, this networking session will bring together several national networks to foster collaboration on Open Science. During Digital Infrastructures for Research 2018, a session involving EOSC-hub, OpenAIRE, GEANT, PRACE and RDA generated discussion and recommendations on collaboration at the national level. This session will review these recommendations and explore follow-up actions. The session will also highlight opportunities to participate in network meetings and benefit from the outputs and services of the participating initiatives. Break into regional groups with facilitator/rapporteurs (depending on room/audience size). Group discussion to review the main recommendations for collaboration that emerged from DI4R. Facilitators/rapporteurs from each group to briefly report back on the discussion and recommendations. * Report on sessions to date?